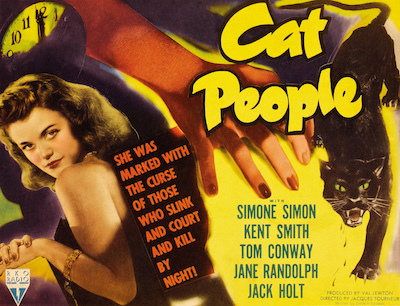 Cat People, directed by Jacques Tourneur in 1942, was the first in a cycle of atmospheric horror films produced for RKO by Val Lewton. The studio had recently cancelled its contract with Orson Welles - after releasing his first two films, Citizen Kane and The Magnificent Ambersons - and was looking for a commercial horror vehicle to compete with Universal's cycle of monster films (Frankenstein, Dracula, etc.). The result is a suspenseful B-movie about Irena, a sexually repressed woman who transforms into a panther when she experiences arousal or jealousy. (Almost fifty years later, Michael Jackson transformed into a panther in his Black Or White music video.) The film begins with a meet-cute at the zoo, and compresses the couple's courtship and marriage into a few hurried minutes. Irena's husband, Oliver, is impossibly patient despite her rejection of any intimate contact. Eventually, and more realistically, he falls for his co-worker, Alice, who describes herself as "the new type of other woman" and is the film's only truly likeable character. The film's Expressionistic lighting is by Nicholas Musuraca, who also photographed the film noir classics Out Of The Past (directed by Tourneur) and Stranger On The Third Floor. There are several striking visual moments: Irena scratching a sofa with her claw-like nails, Oliver in silhouette holding a T-square as a crucifix, and Irena's face under a psychiatrist's spotlight. The sound design is also impressive, especially the use of silence and subtle animal noises. These elements are all combined in the film's most effective sequence, when shadows on the wall and a growling panther frighten Alice in a swimming pool. Cat People has interesting connections to a couple of other films of the period: it utilises the staircase set from The Magnificent Ambersons, and it was parodied in The Bad & The Beautiful, with Lewton as the model for the Jonathan Shields character. Kim Newman wrote a BFI Film Classics monograph on Cat People in 2001: "each viewing has revealed some new aspect, some unnoticed detail carefully crafted, some resonance perhaps unintended. I would happily watch it again this evening, which may well be the highest praise I can give any film."